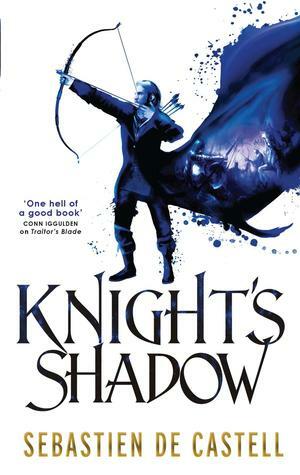 Knight's Shadow is the second book in the Greatcoats series. I read the first, Traitor's Blade, quite a while ago, enjoying it at the time, despite noticing a few flaws / rookie mistakes. Enough time has passed that I didn't recall details of Traitor's Blade's plot when I picked up Knight's Shadow. I did remember the setting, but little else. The Greatcoats live in a fantasy world where justice was once dispensed by travelling judges, who were also master combatants. These judges, the Greatcoats, had been put in place by a king who, in turn, had taken the idea from history, reinstating an order of servants to the crown that had been dissolved centuries ago. Wandering from town to town, adjudicating conflicts, investigating crimes, duelling with local champions (if their verdicts were challenged to a trial by sword), carrying out sentences and setting them to tunes and singing their verdicts - these judges are not like any other I have encountered in fantasy literature. Imagine a sort of minstrel order of Judge Dredds, only with an irreverent sense of humour, tongue in cheek, and a lots of swashbuckling gusto. In the aftermath of the king's deposition and murder, the Greatcoats have been dispersed, each with a final command of the king in his or her ear, to carry on his legacy despite persecution and hostile nobility and knighthoods. Across most of the country, they are deemed traitors for their support of the king's rule. All of this is the backdrop to book one. Book two picks up where the first left off - but even having forgotten much of the plot, I was able to enjoy it. Falcio, our hero, has discovered an heir to the throne, a young girl named Aline, in the first book, and saved her life. Now, with the aid of the mysterious 'Tailor' - mother of the king and general of an army of sorts - he wants to continue protecting her and work towards putting her on the throne. Their enemies, however, are numerous, with a young witch duchess the most sadistic and ruthless of the lot. Some things stand out about the Greatcoats books. Our heroes, Falcio, Kest, Brasti, and whoever joins their jolly gang, are quite fun to be around. Irreverent dialogue, banter, built on deep friendship: they're an ensemble that could have been written by Joss Whedon or William Goldman (of The Princess Bride fame). They might live in a world that's partially inspired by the machinations of George R R Martin-esque nobles, but they give the novels much needed levity and a big heart. Even so, they do live in a twisted world, where those with power are mostly psychopaths or sadists or both. As such, their adventures do take grim turns from time to time. Violence gets gory, gruesome tortures abound. I did enjoy the Knight's Shadow a lot. There were still a few rookie mistakes: two massive plotholes, in particular. However, it's a confident and fun novel, with plenty of momentum to keep you reading. I get the impression this series might be close to reaching parity with Scott Lynch's Gentlemen Bastards books, in terms of fun and addictiveness.